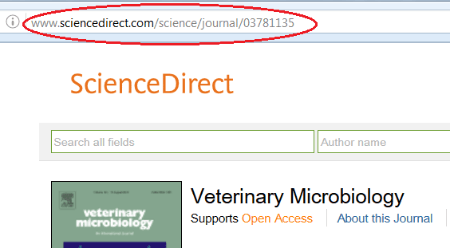 Use links to articles in databases which are restricted to UGA users. Use the tabs in this guide to learn how to find direct links or create a custom link if one doesn't already exist. You may need a direct link for accessing library resources from an eLC page or a browser bookmark that you create. Direct links help to resolve access issues both on and off campus. It is usually best to avoid copying and using the web address (URL) in your browser's address bar because it may only be valid for your current browser session or may not work off campus. However, sometimes it is the only option, especially when creating a custom link. Databases, electronic journals and other e-resources are for the use of current UGA faculty, staff and students only. The use of these resources is governed by copyright law and by the license agreements between UGA Libraries and the publisher. The systematic downloading of data is expressly prohibited. If your link doesn't work, please contact us. Note: Not all URLs can be used in this way because they may contain code specific to your particular browsing/searching session.